A school uniform identifies the children with a school, promoting a sense of pride and also a sense of belonging. Children are expected to attend school in full uniform. All clothing items should be labelled with the child’s name. Any accessories used such as bows, clips etc. should be black/navy blue. Black/navy blue scarves or gloves. Bracelets and necklaces should NOT be worn. Mobile phones and cameras are not to be brought to school. 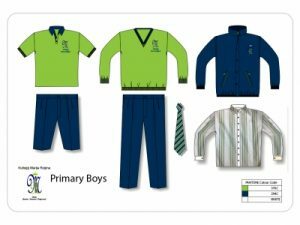 Children not abiding by the school uniform policy may be asked to remove any accessory not belonging to the school uniform and/or the parents may be called in to change their child’s uniform. Besides, the school can inform the parents through a ‘Uniform Note’ which has to be signed and sent back to school. For certain outings, such as performances and cultural outings, children will be expected to wear their full uniform. For other outings children may be asked to wear their P.E. kit. Children will be guided what to wear by their respective teachers prior to the outing. Children not wearing the adequate attire may be left at school. It is important that children keep their uniform clean. Children should wash every day. Teeth should be brushed on a regular basis. A packet of tissues and a small packet of wipes are to be kept in the school bag. Long hair should be tied back for safety and hygienic purposes. Hair should be clean and washed regularly.